Thousands of visitors from all parts of China made a pilgrimage to Shaoshan, the birthplace of Mao Zedong in Hunan Province, on Thursday to pay homage to their beloved leader. Discussions on Mao's life and achievements have been held among devotees in the past few days to mark the 40th anniversary of the death of the founding father of the People's Republic of China, which falls on Friday. Despite Western focus on Mao's mistakes, especially for starting the devastating Cultural Revolution (1966-76), the Chinese government still recognizes and highlights his undeniable role in creating a new China from his errors. While the mainstream public also considers Mao a great leader, within the certain limitations of his time, experts warned of the existence of extreme views about him - some still worship him as a god and try to right all his wrongs, others ignore whatever positive legacy he left. In the Mao Zedong Bronze Statue Square at the center of Shaoshan's scenic center, dozens of memorial flower baskets, sent by visitors from across the country, were placed in front of the 6-meter-tall Mao statue, which depicts the former leader during the founding ceremony of the PRC in October 1949. Many visitors laid flowers, walked around the statue or even knelt to pray to him. Zhang Zhigang, a 70-year-old army veteran from Changsha, Hunan Province who, with a group of retirees, all wearing red Chairman Mao badges pinned to their chests, presented a flower basket at the statue. "Mao Zedong helped lift millions of Chinese out of poverty. Without him, China would never have become what it is today," he said. Ma Zhi'an, a 66-year-old man from Jiangsu Province who had been an "educated youth" sent to the countryside, said he had visited Shaoshan often, and had come this time to pay tribute on the anniversary. Mao's devotees like Ma share typical dissatisfaction about the fast-changing society since China started to adopt market economy elements three decades ago. "Nowadays, farmers and workers are poorly paid, which is unfair. Only Mao Zedong thought can help solve the increasing wealth gap in today's China," he said. Some older people attribute growing reports about corruption to the country's opening-up and reform policies, with a sense of nostalgia about Mao's era. Other provinces and cities also are holding ceremonies and events this week, including Beijing, Tangshan in North China's Hebei Province and Shangri-la in Southwest China's Yunnan Province. Sima Nan, a well-known left-wing commentator, told the Global Times that commemorating Mao is very common in China, and not only among those who suffered the pains of the massive layoffs in State-owned enterprises during the early days of reform, but also officials, entrepreneurs and overseas Chinese. "When Mao left this world 40 years ago, he gave the Chinese people a powerful country with the atomic bomb, satellites and permanent membership in the UN Security Council," Sima said. "A modernized China can never be built without Mao's contributions." Shen Guiping, a professor at the Central Institute of Socialism, said Mao's greatest contribution was his tough methods to create a much more equal society, which was the foundation for the country's successful opening-up and modernization. "However, in Mao's era, there were some mistakes that we should not repeat," Shen said, adding that students' education was ruined during the Cultural Revolution when they were busy with political campaigns and smashing a lot of cultural heritage as Red Guards. Despite popular foreign depictions of Mao as a ruthless strongman who brought China into chaos, the Chinese government still upholds his positive legacy and his indelible role in the history of the Communist Party of China. "Mao is a great patriot and national hero, and a great man who led the Chinese people to change the destiny of the country," Chinese President and the leader of the Communist Party of China Xi Jinping said at a seminar on December 26, 2013 to mark the 120th anniversary of Mao's birth. The authorities also repeatedly warned about some people's attempts to smear the past of the Party, as well as Mao's role. 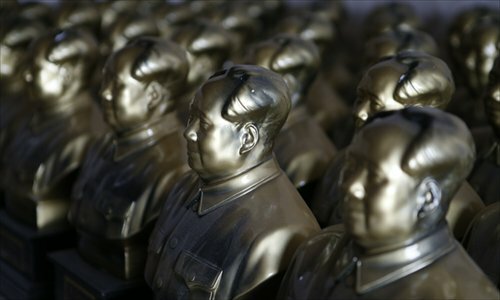 Experts said the tendency of some people to go to the other extreme, trying to deify everything about Mao and consider things in the market economy as "capitalist evils," is also worth paying attention to. Utopia and Red Song Society, two Chinese websites that gather leftist activists, on Thursday both ran a story attacking Alibaba's plan to run an Alcohol Festival on Friday to promote the sale of liquor. "Only those soulless counterrevolutionaries and traitors celebrate the day of the passing of the Chinese people's great leader Chairman Mao, what on earth are you doing, Ma Yun?" said the article, calling out the name of the founder of China's largest e-commerce platform.